Varenne is a station on line 13 of the Paris Métro in the 7th arrondissement, named after the Rue de Varenne. The station was opened on 20 December 1923 as part of the original section of line 10 between Invalides and Croix Rouge (a station east of Sèvres - Babylone, which was closed during World War II). On 27 July 1937 the section of line 10 between Invalides and Duroc was transferred to become the first section of old line 14, which was connected under the Seine and incorporated into line 13 on 9 November 1976. The Rue de Varenne, which runs east from the station, was named after Varenne (or Garenne), local area, which was formerly under the control of the Abbey of Saint-Germain-des-Prés. It is closely associated with French Government, since the Président of the Council (equivalent to Prime Minister under the Third and Fourth Republics) settled in the nearby Hotel Matignon in January 1935. Other Ministries were also located in the private mansions of the district. During World War II, the station was closed because the Government was in Vichy and the private mansions, which had housed Ministries, were deserted. Since the establishment of the Fifth Republic in 1958, the Hotel Matignon has been the official residence of the Prime Minister. Nearby are Musée Rodin (Rodin Museum) and Les Invalides. 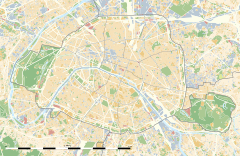 Wikimedia Commons has media related to Varenne (Paris Metro). This page was last edited on 30 December 2017, at 11:30 (UTC).